We’ve been busy at Fine Framers with another Jersey Framing project – one of the many specialist Jersey Framing services we provide. 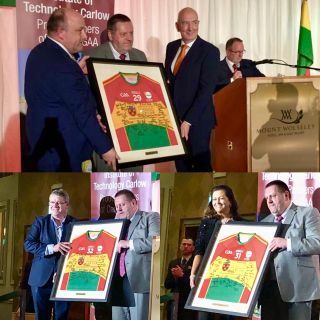 Great to be involved in framing up 3 Signed Carlow Jerseys recently, which were presented to the Team Sponsors last weekend. Looking forward to Carlow’s continued success in 2019. 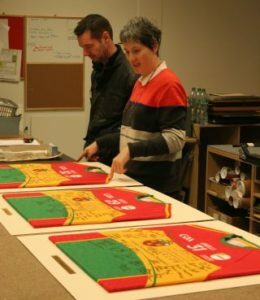 As always, our team at Fine Framers created that special frame ,with care and pride in their work, using real wood and quality materials to showcace the Jerseys for many years to come….creating the gift that’s put on display , not put away. This is just one of the many Jersey Framing services we provide. If you or a family member has a special Sports Jersey, and would like an expert and tailor-made framed display, just get in touch with us. We’ll give your Jersey and other items our trademark care and attention, and produce an attractive display for you too.